In video projections and installations produced during the period from 1998-2006 I became increasingly interested in the concept of ‘location’ as both a place and a time. In works such as Merging/Emerging (1999), A Photographic Truth, 2001, For William Henry Fox Talbot (The Pencil of Nature) (2002) and Returning (2002-03) I have extended this concept of location to include a historical dimension. In these video works there is a crucial relationship to a specific place and time, which is established through the digital juxtaposing of historical and/or documentary images that are associated with a particular time and place. I continued to develop this theme in installations such asIn Temporal View in Amsterdam (2003) and Wawel Castle from Debenicki Bridge (after Krieger). (2004) In both these digital projections there is an important relationship between the original photographic images, their place in the canon of photographic history, and a contemporary view of the original locations. I am particularly interested in promoting an awareness in the viewer of the span of time between two related moments that may be many years apart. The historical dimension that many of these installations and projections include extends to a fascination for the history of technology, especially where this technological history has had an impact on our aesthetic and cultural lives. Fenetre Digitale (2000) was a site-specific work for a gallery within the Passages des Panoramas, an influential Parisian shopping arcade, whose innovative architecture fascinated Walter Benjamin. Mothlight (1998) and Mothlight II (2001) both draw on an episode from the early history of the computer making references to the origins of the phrase “a bug in the system”. Interwoven Motion (2004) was made as a prototype for a future ‘self-powered’ video installation and was intended to make historical connections to its site on the edge of a wooded area with a view over Coniston Water that had once been part of the estate of John Ruskin, the influential Victorian art critic and theorist. It was a view that Ruskin greatly admired, and that he wrote about in his voluminous diaries, which chronicled, amongst many other things, the constant flux in the visual appearance of his surrounding landscape. Interwoven Motion is a development of earlier gallery based work I have made which makes use of ‘renewable energy’ technologies including solar panels and wind turbines, including Mothlight (1998) and Mothlight II (2001), and For William Henry Fox Talbot (The Pencil of Nature) 2002, but is my first attempt at developing a self-powering outdoor video installation which would respond to its environment incorporating aspects of the weather into a stream of images of its visual surroundings. 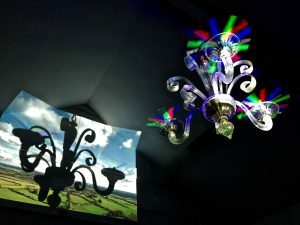 The use of ‘live’ cameras has been a feature of my video installations for some years, and in this period it has been extended to the use of web cams. Merging/Emerging (1999) and For William Henry Fox Talbot (the Pencil of Nature) (2002) both feature web casting technology, and Interwoven Motion employs a set of 4 live cameras to produce the image stream. Resurrection (2005-06) draws directly on the experience of developing Interwoven Motion, bringing both technological and natural elements back into the “white cube” gallery space to create a companion piece. The living tree of the Grizedale project has been conjured up in a revivified form within the interior of the gallery/museum. The video images of the fluttering leaves in Resurrection present a record of a previous (living) existence, recreated via technology. 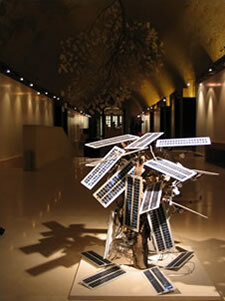 The electrical energy used to bring the resurrected tree back to life is transformed within the gallery space from electricity to light and back again; the shimmering leaves are experienced as both light reflectors and light receptors, the solar panels as both surrogate leaves and transforming technology. Many of the interests and concerns from the previous period continue to fascinate and intrigue me- the flow of energy in all its forms and manifestations, the fluidity of matter, of thought and information, of light and time. I have also continued to be interested in the power and significance of particular locations and have developed a number of projects relating to the historical and cultural sense of place. 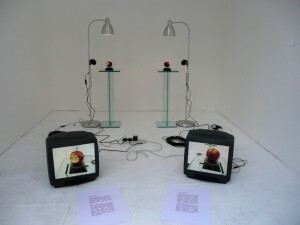 Although the majority of this work has taken the form of moving image installations, a number have also included web-based elements. (Some works, such as Turing Test and Xtea (both 2009) were initially developed as on-line projects, whilst others such as The Monument Project (Si Monumentum Requiris Circumspice) (2008-2011) and In Darwin’s Garden (2011-2013) were conceived as works in multiple formats. 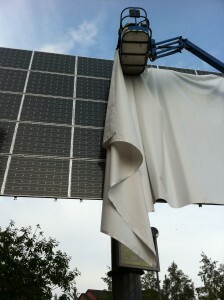 My interest in renewable energy systems has also continued to be an important aspect, and I have developed a number of works in which photo-voltaic panels are a major component of the work such as the 2011 projection event SunBeam, the gallery version of Turing Test (2009 & 2015) and outdoor sound installations Aeolian Processes (2013) and Aeolian Processes II (2014). Alongside the large-scale and site-specific installations of this period, I have also produced a number of short single and double screen works, such as One Minute in Pisa (2010) and Autumn Moon (2012), Video Haiku No. 1 (2015) and Rebirth: Into the Light (2016) and Pallindrome (2017), which with the exception of How Many Greens? (For Stan Brakahge) (2009) have also been presented as small-scale installations. I’m currently working on Impossible Objects, an ongoing series of small-scale works that also involve the use of renewable energy elements: Imagine (No Pollution) (2016), Blue Sky Thinking (2017) and Flying Lampadario.